Dietary fiber is found in fruits, vegetables and grains and should be included as part of a healthy diet. There are two forms of dietary fiber: soluble and insoluble fiber. Both are essential for your health and digestion. The role of soluble fiber in digestion is to attract water which turns it into a gel and slows digestion. Soluble fiber is proven to lower cholesterol and decrease the risk of heart disease. 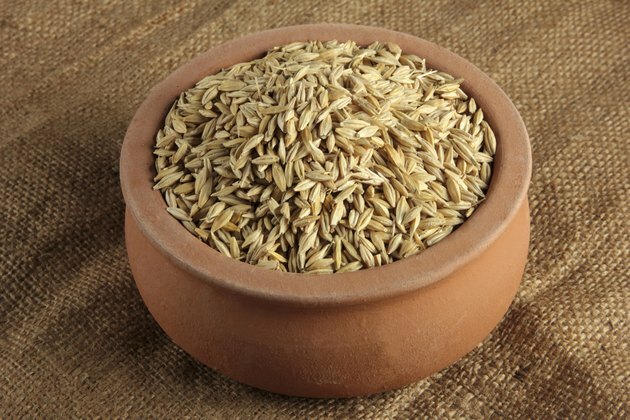 Oat, bran and barley are highest in soluble fiber. Oatmeal provides a total of 4 grams of dietary fiber per serving. Of the 4 grams of dietary fiber, 2 grams are soluble fiber. Bran provides 6 grams of dietary fiber per one-quarter cup. One serving of bran cereal provides up to 3 grams of soluble fiber. Barley, bulgur, whole wheat spaghetti and wheat germ contain 4 grams of dietary fiber including 1 gram of soluble fiber. Peanuts have the most soluble fiber per serving for nuts. In one-quarter cup of dry roasted peanuts, you will get 1 gram of soluble fiber and a total of 3 grams of dietary fiber. 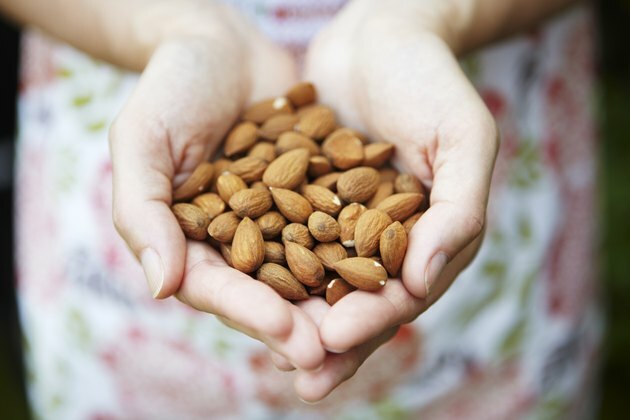 Almonds and Brazil nuts both have at least 1 gram of soluble fiber per serving. Flax seeds provide almost 7 grams of soluble fiber in one-third cup, one of the richest sources available you can add to entrees or sprinkle on cereal. Sesame seeds and sunflower seeds both provide 2.5 grams of soluble fiber, also a good source. 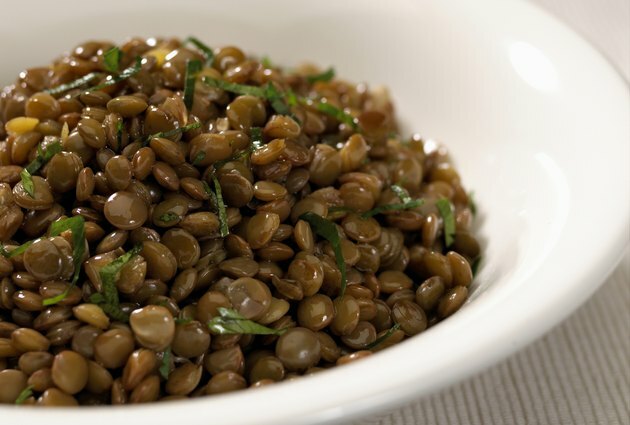 Lentils provide the most dietary fiber per serving compared to beans and peas. In just one-half cup of lentils, you get 8 grams of dietary fiber, including 1 gram of soluble fiber. However, beans contain the most soluble fiber per serving. Lima beans, baked beans and kidney beans provide 3 grams of soluble fiber per one-half cup serving. Navy beans, also high in soluble fiber, provide 2 grams per serving. Most peas provide 1 gram of soluble fiber per serving. Several fruits and vegetables are excellent sources of both dietary fiber and soluble fiber. 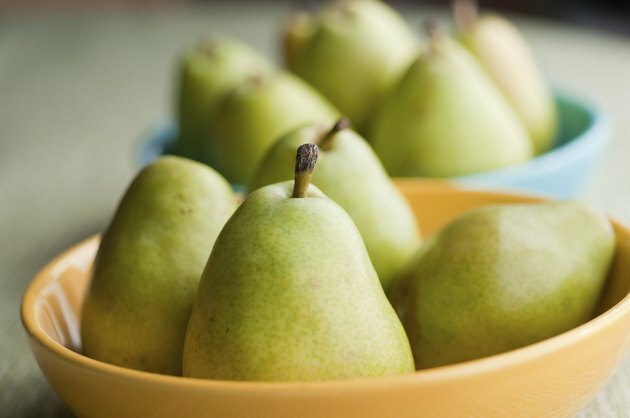 One large pear has the highest soluble fiber content, with 3 grams per peach. 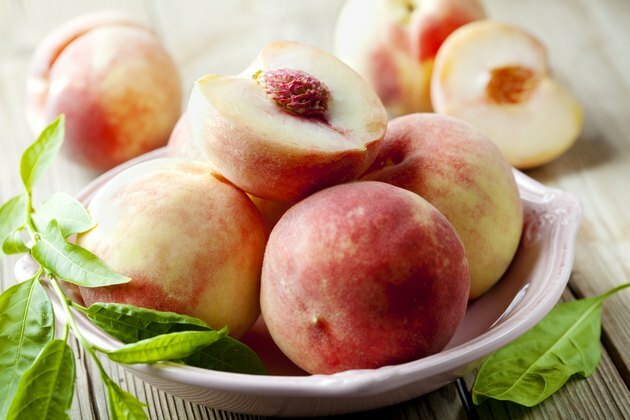 Apples, blueberries, plums, strawberries, fresh and dried apricots, bananas, oranges, cherries, dates, peaches, dried prunes, raisins, cantaloupe, grapefruits, grapes and pineapple are all good sources of soluble fiber. Vegetables containing at least 1 gram of soluble fiber per serving include parsnips, carrots, brussels sprouts, baked potato with skin, spinach, squash, string beans, cabbage, baked sweet potato, turnips, broccoli, kale and zucchini.